Winship Cancer Institute of Emory University has earned the prestigious comprehensive cancer center designation from the National Cancer Institute (NCI), placing it in the top one percent of all cancer centers in the United States. Effective immediately, Winship becomes the newest NCI-designated comprehensive cancer center in the nation. 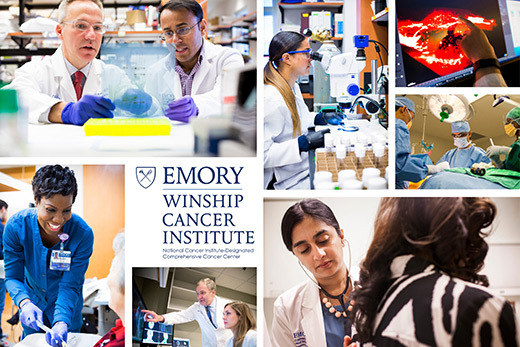 This elite NCI designation means that Winship has demonstrated that its outstanding programs are reducing the cancer burden on the state of Georgia through research conducted in its laboratories, its clinical trial program, and its population-based science. Winship members have received $110 million in external peer-reviewed funding in 440 grants in support of this innovative research. "The NCI comprehensive cancer center designation signifies Winship's outstanding research and education programs are changing the lives of the citizens of Georgia for the better," says Winship Executive Director Walter J. Curran, Jr., MD. "As the first and only NCI-designated comprehensive cancer center in the state, our clinicians and researchers work tirelessly to substantially lessen the burden of cancer on the lives of Georgia's residents." An estimated 50,000 Georgians will be diagnosed with cancer this year. About a third of them will receive some component of their treatment at one of Winship's clinical locations in metropolitan Atlanta. For patients, Winship's innovative research translates into better ways of detecting and diagnosing cancer. Patients also have full access to teams of experts using approaches to cancer not available outside of a top research cancer center. Winship has over 250 clinical trials enrolling patients in pursuit of better approaches to nearly every type of cancer. Emory President Claire E. Sterk says that the NCI comprehensive cancer center designation will help improve the health and well-being of Georgia citizens. "Winship's achievement is the result of years of hard work and commitment by many people, both within the university and the greater Georgia community. The NCI comprehensive cancer center designation will help Emory expand its extraordinary faculty of scientists and innovative thinkers by attracting new and highly qualified investigators," she says. "We thank Governor Deal and the Georgia Congressional Delegation for their support of Emory's mission to better serve Georgia's citizens." "Earning the NCI comprehensive cancer center designation is a tremendous honor for Winship Cancer Institute and the state of Georgia," says Governor Nathan Deal. "This distinction elevates Georgia as a model for superb cancer care and scientific discovery." For all Georgians, the comprehensive cancer center designation recognizes that Winship researchers are studying the environmental and genetic issues unique to cancer in Georgia with the very specific goals of reducing the risk of cancer and detecting cancer at the earliest possible stage. "Winship is the only institution of its kind in the state. It has become Georgia's epicenter of cancer research, education, and care," explains Jonathan S. Lewin, MD, Emory University's executive vice president for health affairs and president, CEO, and chairman of the board of Emory Healthcare. "Winship is a gateway to clinical trial enrollment for metro Atlanta and beyond, importantly including our historically underserved populations." Winship's comprehensive cancer center designation was awarded after a rigorous evaluation process conducted by the NCI that included submission of a written grant and a site visit conducted by more than two dozen scientists from peer institutions. During that visit, the review committee watched videotaped remarks from former President Jimmy Carter supporting Winship's application. He said: "I never knew that my own life would be saved by research that was funded through the NCI and its program that laid the foundation for such centers as Winship. Recently, I needed the very care that I have advocated for, care that exists through NCI's cancer center program." Winship earned its first NCI cancer center designation in 2009, and the grant was renewed in 2012. Established 80 years ago by a foundational gift from Robert W. Woodruff, Winship Cancer Institute continues to receive funding support from the Robert W. Woodruff Health Sciences Center Fund, Inc. Mr. Woodruff believed that no cancer patient should ever have to travel outside the state of Georgia for care. The NCI comprehensive cancer center designation for Winship continues to make that vision a reality. "Winship is fulfilling Robert Woodruff's vision of a world-class cancer center," says Curran. "Through outstanding research discoveries and patient care, Winship is leading the way in ending cancer as we know it here in Georgia and around the world."